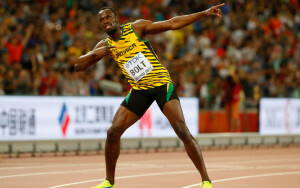 Nowadays Usain Bolt’s statements regarding his career flow continuosly among confirmations and denials; the only fixed point is that the world record holder’s career will not be that long. According to AFP agency, Bolt would have talked once more about his future, setting an important milestone: “Rio will be for sure my last Oltmpic Game. It is always difficult to keep the motivation up to go on for four more years.” These are supposedly the words said by Boly on last Friday. In a TV interview for a Jamaican tv channel, Bolt said that his trainer suggested him to compete in a fifth Olympic Game (Tokyo 2020). Usain Bolt, already in his prime, will celebrate 34 years in 2020, getting close to the age when other great champions retired: Carl Lewis (35), Michael Johnson (33) and Donovan Bailey (32). “The older you get the hard it is to reach the right physical condition” Bolt said during the interview in January. Bolt has been citing for some time a conversation he had with Johnson, who retired at the peak of his career after having once more conquered the 400m in Sydney 2000.